Following are a few notes from my talk at the 2012 Esri User Conference. You can watch the complete video here. Geography is our platform for understanding the world. GIS is making geography come alive. GIS condenses down all of our data, our information, our knowledge, and our science into a kind of language that we can easily understand: maps. Maps help us integrate and apply our knowledge. Maps also tell stories—stories about almost everything in our world. We need to harness the power of maps to design the future and create better outcomes. I’m very confident that we can do this. One reason is that GIS itself is advancing; it’s getting more powerful and it’s getting easier to use. It’s evolving with lots of new capabilities. It’s moving to the cloud and becoming more pervasive. GIS has evolved mapping to a new level, creating geography as a platform. This new platform allows geographic knowledge to be pervasive, connecting traditional GIS with the whole new world of apps and devices. This will enable the sharing of GIS knowledge with everyone. At the same time, GIS is leveraging many other trends, widespread measurement, big data, pervasive computing, cloud computing, software as a service (SaaS) computing, device computing, apps, and the whole world of science itself. 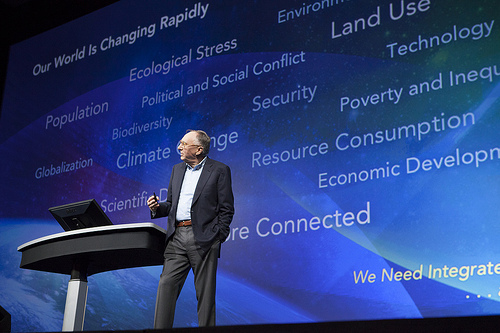 my opening talk from the 2012 Esri User Conference here. The convergence of GIS with these trends will support the vision of—geography as a platform—empowering us to re-imagine our world and integrate geographic knowledge into everything we do. Cloud GIS integrates all types of geographic information—maps, data, imagery, social media, crowdsourced information, and sensor networks, and much more. As we continue to “wire up” the world, we can make this information accessible and actionable. Cloud GIS enables ubiquitous access to geographic knowledge; it integrates the traditional work of geospatial professionals with a whole new pervasive world of apps. It takes what has been a relatively scarce commodity—geographic knowledge—and makes it abundant. And web maps provide a medium for integration and understanding, making this information widely accessible in simple forms. This widespread, easy access to geographic knowledge is what we mean by providing geography as a platform for understanding. The sharing of geospatial knowledge will create the content for “geography as a platform.” This will open our world and create a new level of understanding. As more organizations embrace this new pattern, and adopt a culture of collaboration and sharing, the GIS community will benefit greatly. They will be able to do their work better and extend the role of GIS in our organizations. Our work at Esri is about enabling our users to do their important work. Our focus is on developing and supporting a robust technology platform that supports a wide variety of applications. We take that responsibility very seriously. I want to thank you for entrusting us to do that.